Looking to add something to your home or business with a little sophistication and taste? Look no further than our décor from the Jubba collection! 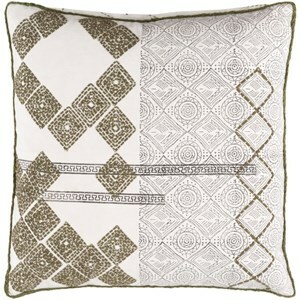 These pieces are beautifully styled on a two tone pillow lavashed with modern designs and inlays. Made by artisans in India, these pieces are knife edged and hand woven. Spot clean only. The Jubba 22 x 22 x 5 Pillow Kit by Surya at Hudson's Furniture in the Tampa, St Petersburg, Orlando, Ormond Beach & Sarasota Florida area. Product availability may vary. Contact us for the most current availability on this product. Browse other items in the Jubba collection from Hudson's Furniture in the Tampa, St Petersburg, Orlando, Ormond Beach & Sarasota Florida area.